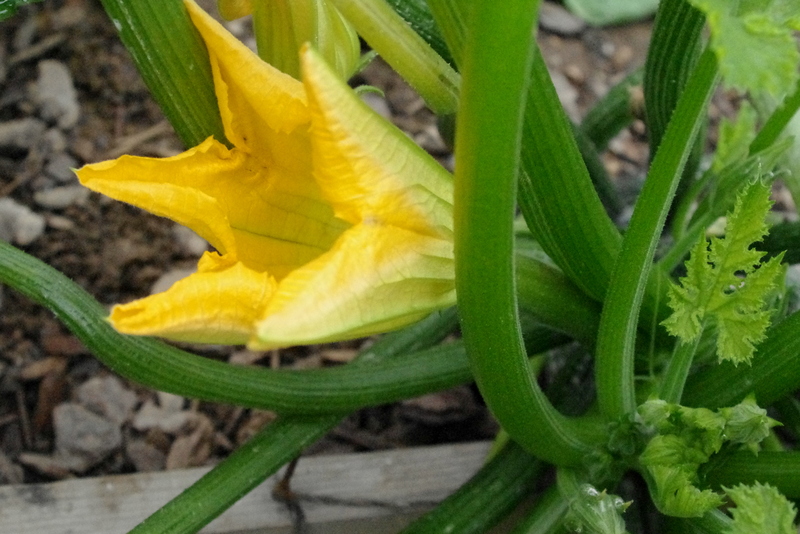 After it became clear that summer squash had made the Hurricane’s top-ten summer veggie list, we planted a second batch of zucchini soon after the first batch had tapped out. 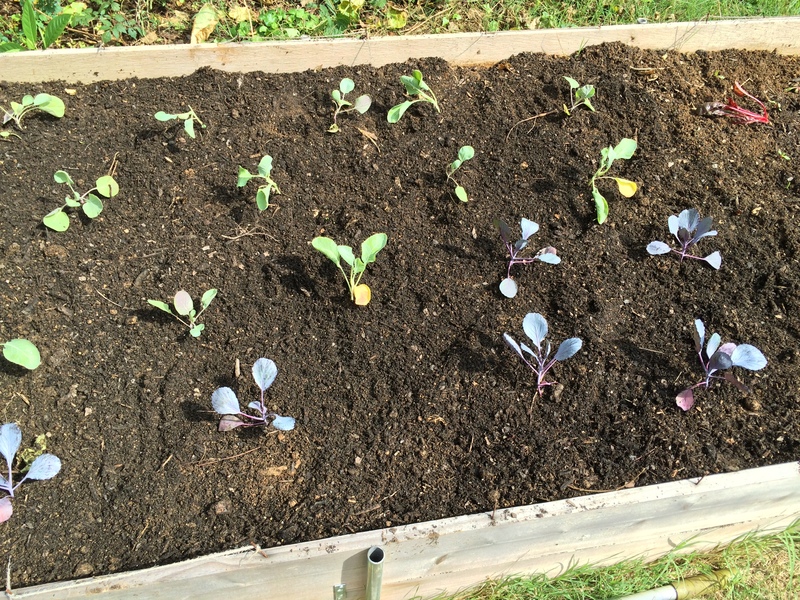 This time around, they occupy real estate formerly held by under-producing purple royal beans. Located at the edge of the bed — which seems to work well and allows them to drape down to the grass — they occupy about four square feet of space. The three young plants (seeded around 8/21) contributed to a delicious Moro side which accompanied the ridiculously chewy good burgers from Porter Road Butcher. And there are more to come. Both burgers and courgettes. Toss the courgettes with the salt and place in a colander. Allow them to sit for at least 10 minutes over a draining board or sink, then pat dry with some paper towel. In a large skillet, heat the olive oil over a medium heat. Add the almonds and fry for a few minutes, until they just start to turn a pale pink-brown, then remove them with a slotted spoon and add the courgettes to the pan. (Keep on eye on the almonds as they will go from perfect to burned within seconds.) Cook for about 10 minutes, stirring occasionally, until softened. Add the garlic, tomatoes, and half the mint and continue to cook for about 15 minutes, until very soft, sweet and starting to break down. Now return the almonds to the pan an cook for 5 minutes more, squashing any bits of tomato tomato that are too large for your liking. Add the remaining mint, season with salt and pepper and serve. First there were tomatoes. Eight pounds of them. Next there was garlic. 21 cloves. Then there was gravy. Frankies Spuntino style. For years I struggled to make a decent tomato sauce. In went the onions, the garlic, the dried herbs(! ), the carrots(! ), the vinegar, the sugar, the whatever. I’m Dutch. I’m not supposed to make a good sauce. And then I moved to Philly and discovered gravy. Not just any gravy, but my Italian friend’s grandma’s gravy. Which is damn fine. And simple. But I still couldn’t do it right. And then I discovered Frankies Spuntino. Yeah, it’s sauce, but is so much more. With so much less. Bring a very large, very deep pot of water to boil. Ideally a canning pot with a built-in colander. 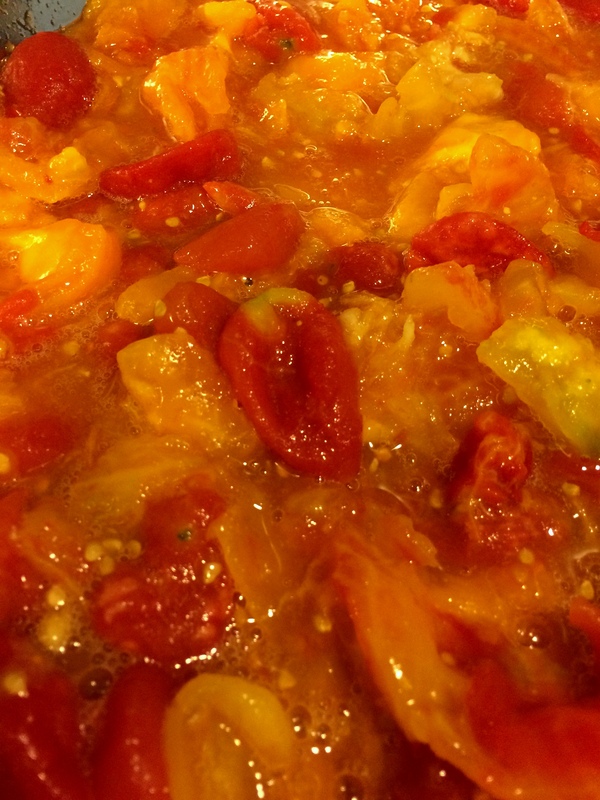 Score the bottoms of your tomatoes with an X and place the tomatoes in the boiling water for 30-45 seconds. Drain and rinse with cool water. Remove the skins. Combine the olive oil and garlic in a Dutch oven and cook over medium-low heat for about 10 minutes, stirring or swirling occasionally, until the garlic is deeply colored — striation of deep brown running through golden cloves — and fragrant. 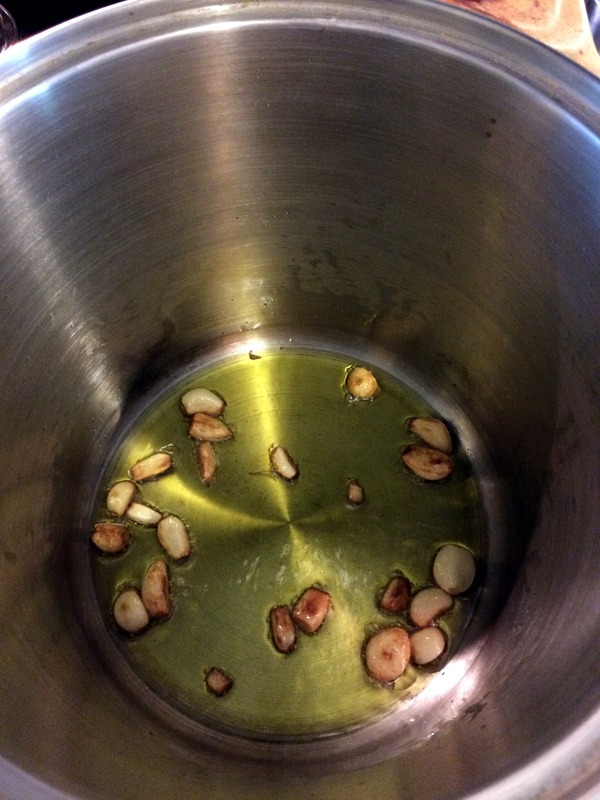 If the garlic starts to smell acrid or sharp or is taking on color quickly, pull the pan off the stove and reduce heat. 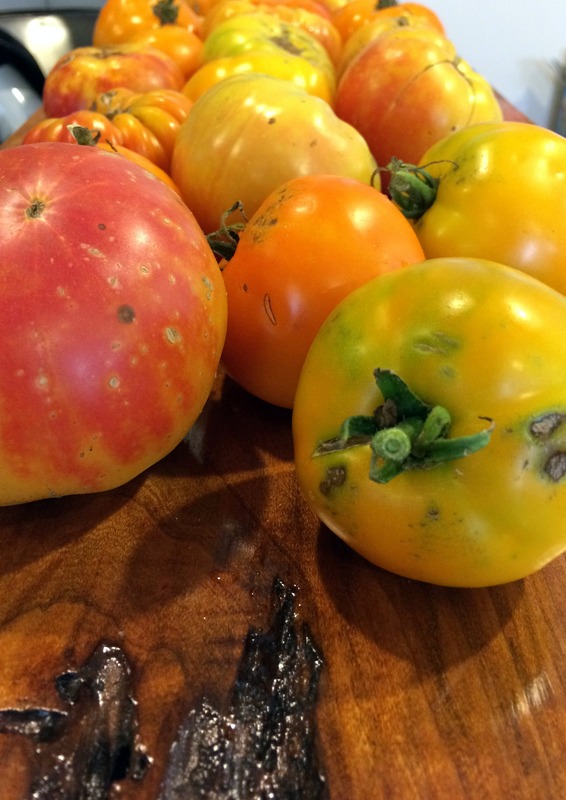 While the garlic is getting golden, deal with the skinned tomatoes. Pour them into a bowl and crush them with your hands. You’ll want fairly small chunks. Check the sauce for salt at the end. the sauce can be cooked with meat at this point, or stored, covered, in the fridge for a few days or frozen for a long winter’s night.